Welcome to the October edition of our Opto Newsletter! Under our motto of Optics – Imaging – Automation, we are pleased to introduce our system integrator and machine manufacturer customers to our new family of Imaging Modules. These unique plug and play modules combine optics, lighting, camera & electronics in a compact unit that delivers micrometer resolution and full interface control to smart production, process analysis and quality control applications. Advanced automation, machine learning and digital data exchange are key features of Industry 4.0, and are leading next generation factory and process design. Here at Opto, we’re excited to launch a family of imaging modules designed exclusively for this environment. The first of these – the Opto PROFIL module enables ultra-high accuracy profile measurments to be taken on inline processes. This module was recently used in conjunction with a Staubli high precision robot to perform high speed, high accuracy measurment of medical devices. We’re pleased to announce the launch of our new micro calibration target plate. With resolution lines of 1000LP/mm and several additional resolution patterns for microscopic image analysis, the Opto Micro Calibration slide is packed with useful calibration functions at an attractive price. 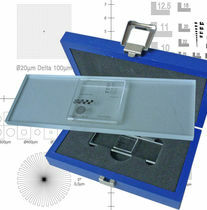 Supplied in a high quality wooden case, the Opto calibration target is your everyday tool for optical system optimisation. Contact us now for a special launch discount! Developing unique, universal microscope accessories has been a founding business at Opto for over 30 years. We’re very excited to announce that we will shortly be launching the most comprehensive catalog of unique Opto accessories ever released! This new version will include a number of brand new products in addition to updated versions of some of our most popular longest standing products. For a quick preview of some of our new products, why not visit our new page at the DirectIndustry online portal.